Running the “world's greatest” rafting trips is our commitment to you everyday! 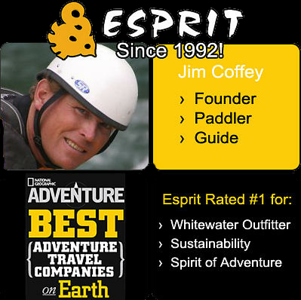 If you have a longing for the river, an appreciation of the wilderness and a “spirit of adventure”... join us at Esprit! Raft Canada's most famous whitewater river! The Esprit “Two-Channel” day trip will take you down both the Middle and the Main channels of the Ottawa River. Only Esprit offers you both channels of the Ottawa River in the same day. That means twice the rapids, twice the adventure, twice the excitement. Whitewater Rafting Ottawa River, Canoeing, Kayaking, Swift water Rescue, Wilderness First Aid, River Rescue, Leave no trace and much more!